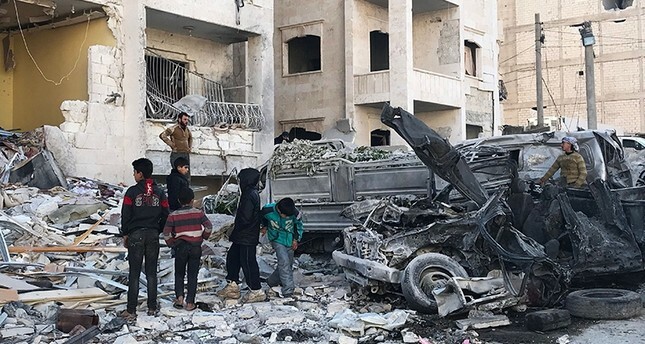 At least 34 people were killed and 70 others injured in four explosions in Syria's northwestern city of Idlib on Sunday. The fatalities included 19 civilians of whom were 11 children, the Syrian Observatory for Human Rights added Monday. According to an Anadolu Agency correspondent in the region, four car bomb blasts occurred in an area in the city center where vehicles were parked. Another 24 civilians were killed in airstrikes on residential areas in multiple towns and villages throughout the province, sources from the Syrian Civil Defense known as the White Helmets said. The areas were the target of numerous attacks throughout the night, they added. Photos and video from the activist-run Thiqa News Agency and Baladi News Agency show heavy damage along what appears to be a major avenue in Irbil city, with several buildings damaged and vehicles overturned by the car bomb blasts. Ambulances and rescue teams rushed to the explosion site and efforts are under way to pull out the bodies and rescue the injured trapped under the rubble of the targeted building and neighboring houses, The Syrian Observatory for Human Rights said. The monitor said the explosions targeted the headquarters of an opposition faction in Idlib. The city and the province are controlled by several rebel factions and insurgents vying for dominance, the most powerful being an al-Qaida-linked group, Tahrir al-Sham.